How do I go about erasing a wax tablet? 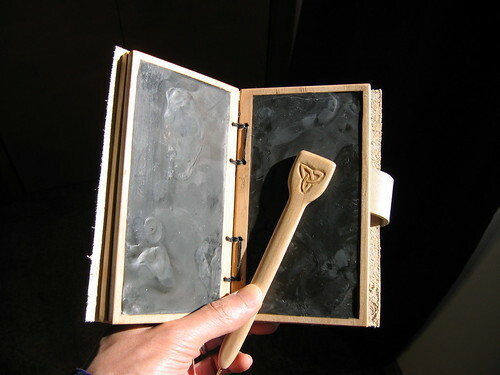 Typically the writing surface of a wax tablet is comprised of beeswax on a wooden board. 1. Heat the tablet to prepare the wax for erasure (a hair dryer may work). 2. Smooth out impressions in the wax using a broad, flat instrument - often the back end of a stylus will work. Are you sure you erased everything? Under the wax, on the wood frame, an inscription could have been made. See Herodotus' story of Demaratus hiding a message under the wax tablet. It is one of the earliest recorded cases of Stenography - in this case: hiding something in plain view under an erasable surface. Raises the question: is there an un-erasable surface under every erasable surface? Little wonder the wax tablet is a popular metaphor for memory from Plato and on.